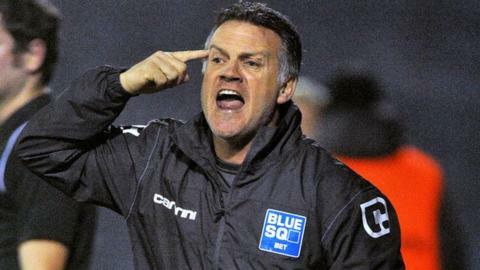 AFC Telford United boss Andy Sinton heads into Saturday's FA Cup fourth qualifying round home tie with Nuneaton looking to reach the first round proper. Telford lost 4-0 against Chelmsford City in the first round last year. "I want a run in the Cup," Sinton told BBC Radio Shropshire. "We've not had a run in the Cup since I've been here, with defeats against Buxton and Chelmsford." That third qualifying round home defeat by Buxton two years ago, having beaten Stourbridge 5-2 in the previous round, was followed by last year's exit at Chelmsford - in the first round proper. And Sinton admits that his own lack of success with the Bucks in the world's oldest knockout competition is somewhat out of keeping with the club's illustrious record as great non-league Cup fighters. "This club's steeped in tradition in the FA Cup," adds Sinton. "And I would like my side to be part of that tradition and history. A non-league club will go quite far in the FA Cup this year. Why can't it be us? The old Telford United's best run in the cup was in 1984-85, when Stan Storton famously led the club to the fifth round. But former Queens Park Rangers, Tottenham Hotspur and England winger Sinton went a round further as a player, reaching the quarter-finals with Brentford in 1988-89. The Bees beat Manchester City and Blackburn Rovers before losing 4-0 against Liverpool at Anfield, in which Sinton put in a performance that sealed a £350,000 move to QPR. Sinton now hopes that, third time lucky, the Cup will be kind to him as a manager. "A non-league club will go quite far this year," he added. "Why can't it be us? But it can only be us if we beat Nuneaton." Eighth-placed Telford, 14 places higher than Boro in the Blue Square Bet Premier table, lost 3-1 at Nuneaton when the two sides last met at Liberty Way back in September. And, to add to a rivalry between the two clubs that goes back to Telford's early days in non-league football, Nuneaton will have four Bucks Head old boys making their return - Simon Forsdick, Jon Adams, Gavin Cowan and Andy Brown.